M K Stalin still struggling to consolidate the Dravidian vote bank. While the BJP has been grappling to increase its support base ever since Jayalalithaa’s health worsened, noted film personalities like Kamal Haasan and Vishal have been trying to convert their popularity into votes. Now superstar Rajinikanth, after contemplating on a political foray for more than two decades, has launched a new party that promises to fill the vacuum created by Jayalalithaa’s death and Karunanidhi’s retirement. 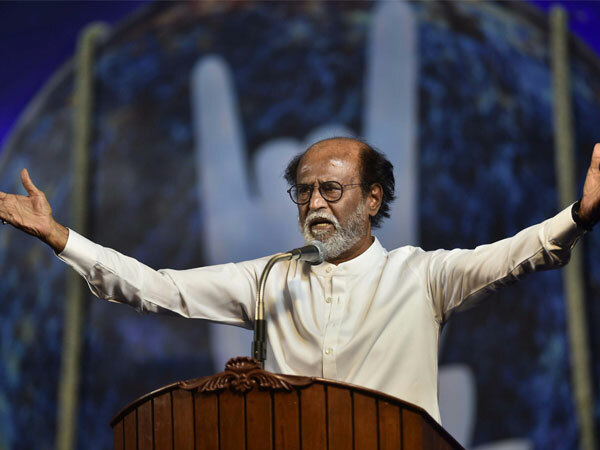 Rajinikanth holds the promise of stepping into the space vacated by the two former Tamil Nadu chief ministers because he is the biggest star of them all – if one goes by his iconic status in Indian cinema. The media celebrated his entry when he announced it on New Year’s eve. But, sceptics wonder how far he will be able to convert his star value into votes. From a fan base point of view, Rajinikanth might be the biggest of the film stars to have entered southern politics, but he is unlikely to be another MGR, say political scientists. “It is totally unfair to compare Rajinikanth with MGR in terms of charisma, popularity or public life. As an actor, MGR never had commercial intentions and he never talked politics to promote cinema,” said Manivannan, head, department of politics and public administration, University of Madras. MGR built an image as the messiah of the poor and marginalised sections. His humble background and nature as well as some of his schemes retained his popularity among the poor despite the corruption charges. “Rajini has never made his stand clear on the plight of farmers in the state. He has not taken a stand when several fishermen went missing recently. He has been silent when people were standing in queues post demonetisation. Working with fan clubs to promote cinema is not like working with people. Cinema itself has become a big corporate event,” adds Manivannan. However, his charm cannot be fully dismissed. But political observers believe that Rajinikanth, with almost nil political work to his credit, cannot become an alternative for Jayalalithaa in the next assembly elections. If he bags a few seats, it will only add to the fragmentation of votes. This is where the need for an alliance comes into the picture. While announcing his political decision, Rajinikanth had announced that his party would be secular one, above religion and caste. If he has to consolidate his fan base, it is important to remain secular as his fan base cuts across all religions and castes. Any alliance with the BJP will be detrimental to the support he enjoys among his fans. Another important plank of his party is ‘anti-corruption’. Both the Dravidian parties and the Congress have had to battle allegations of graft and an alliance with them will put his anti-corruption promises at stake. In short, the superstar will have to build a party on his own steam. But the fan base alone is unlikely to be strong enough to guarantee him the numbers in the next assembly election. According to Manivannan, the registered fan club won’t be more than 50,000. The new website launched by him has lakhs of members. However, many of these curious internet users need not necessarily vote for him. Garnering votes is not like getting fans to promote the films. M G Ramachandran, Jayalalithaa and Vijaykanth came from the film world. Of them, MGR was the one who directly benefitted from his film career. But if the fan base was the only criterion, his contemporary, thespian Sivaji Ganesan, had a bigger fan base than mattinee idol MGR. “It is a misconception about Tamil Nadu politics. All those who have made it big in politics have spent time with the people and tried to resolve their issues before the people accepted them as their leaders,” says Ramu Manivannan. It was not a cakewalk for MGR either. He was a supporter of the Congress party before he joined the DMK in 1953. He worked for about 10 years in the party before he became a member of the Tamil Nadu legislative council in 1962. Another five years of struggle saw him as an MLA of the Tamil Nadu assembly. In Jayalalithaa’s case, her draw as an actress alone did not help her in politics. She had worked with MGR and proved she could be successful when MGR had to be away due to illness. Her struggle to prove that she could step into MGR’s shoes is well known. In course of time she built a reputation for being an iron-willed woman who could take hard decisions and assert Tamil voice in New Delhi. Actor Vijaykanth’s stardom did provide the entry point but it was the support of a certain community for political purposes that gave him the edge. Political observers regarded him as a decisive power centre in Tamil Nadu politics. However, he failed to seize on his opportunities. Rajini’s fans are typically those who have seen him on the silver screen as the infallible hero in the 1980s and 1990s. These are fans largely in their 40s and some in the 30s. Rajini has not been able to attract staunch fans in the younger group of film lovers. Though the films that were released in the 2000s made lot of noise, many of them flopped in the box office. For the younger cinemagoers, Rajini’s films are occasions to make some noise. But they may not make the film a hit nor vote him to power. Manivannan believes the younger generation is critical of Rajini. Jayalalithaa proved how women votes are crucial in every constituency. Even in tougher times, women voters have stood by her. Unlike any other state, women in Tamil Nadu across economic strata have proved that they have their own voice when it comes to choosing the leader. Jayalalithaa’s reforms were centred around women. Women do not form any significant portion of Rajini’s fan base. The characters he plays in his movies have always towered over the female characters. Only ‘Kabali’ saw a couple of strong women characters. In the electoral game, he will have to win the women hearts. He may be able to, but for that he will have to prove himself. “One of the vexatious issues faced by Tamil Nadu women is consumption of liquor by men. Let him take a stand on the state’s liquor policy and women will stand with him,” says Manivannan. Water is one of the biggest concerns of Tamils and the state has been part of the water wars with all its neighbours at some point of time. Water disputes incite parochial feelings in the people of Tamil Nadu. Though Rajini is a Mahar­ashtrian, he was brought up in Karnataka. His allegiance towards the Tamils has come up for scrutiny several times when the Cauvery water disputes erupted between the two states. Cauvery will be a weak spot for Rajni and his political opponents could try to manipulate this weakness whenever the dispute arises. “Rajini will have to overcome issues pertaining to parochialism. MGR was a Malayali, but no one saw him as a Malayali as he identified with the Tamil people,” adds Manivannan.